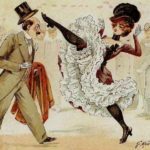 Get yourself ready to CAN-CAN! Immerse yourself in twirling skirts and petticoats, high kicks, (jazz) splits and cartwheels! The French Cancan is high-energy, physically demanding dance that became a popular music hall dance in the 1840s, continuing in popularity in French cabaret to this day. Get yourself familiar with moves like the high kick or battement, the rond de jambe (quick rotary movement of lower leg with knee raised and skirt held up), the port d’armes (turning on one leg, while grasping the other leg by the ankle and holding it almost vertically), the cartwheel and the grand écart (the flying or jump splits). Michelle will combine jazz techniques with the French cancan in a playful Burlesque setting. We CAN CAN CAN, because we CAN!